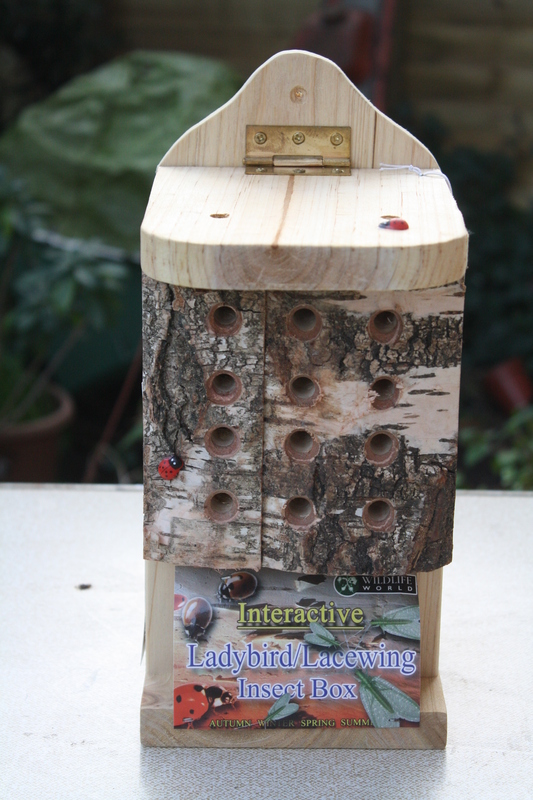 One of the presents I received this Christmas was a wooden house for lacewings and ladybirds to shelter or spend the winter in. Over recent years, one or two lacewings have slipped into our house to be discovered later on a wall or window. They’ve always arrived singly. Added to that, I have seen, I think, one during a walk round some local woodland. So we were surprised when, on an evening last October, six of them gathered on the glass on our back door and window. When we opened the door to get a closer look, five flew into the kitchen. My son caught them in a bug jar, whereupon we had a closer look before releasing them into the night. Our visitors were mostly green, but one was yellowy brown. They measured around 11 to 12 mm in length and had long, transparent wings, big shiny eyes and very long antennae. On that particular evening, it had been raining on and off, so perhaps they had come to the door to find some shelter? Possibly, as well, they had been attracted by the light inside. One of the green lacewings. Lacewings are named after the patterning of the veins in their wings, which are longer than their bodies and are held over their bodies when they are at rest. The next visit we had from a lacewing, again on the outside of the kitchen door, was on November 3rd. Another was seen on Bonfire Night. Both of these were yellowy brown in colour. Two nights later, a green lacewing appeared in the kitchen. We thought that was probably the last we’d see of these insects this year, believing their flight season ended in October. However, when I drew back the curtains on November 17th, at 7am, I discovered a lacewing on the inside of the front window! Probably the mild weather had prolonged their flight season. Whatever the reason, there were clearly good numbers of lacewings about here last year. Further reading has shown that some lacewings are around all year, and attempt to hibernate until the spring. Michael Chinery in the Collins ‘Complete British Insects’ states there are about 18 species of green lacewings in the family Chrysopidae. “The insects are often called golden-eyes because of the brilliant golden or brassy shine from their eyes.” He continues that they have conspicuously forked veins at the outer edges of their two pairs of wings. Despite their rather delicate appearance, adults and larvae feed mainly on aphids and other small insects, thus they are very worthwhile to encourage into the garden. The larvae of some species camouflage themselves with the drained skins of their prey. One species of green lacewing, Chrysoperla Carnea becomes flesh coloured before entering hibernation, it states in the book. And hibernation can take place in buildings. However, I cannot say whether we found this species at our house in King’s Lynn, but it did make us wonder if the insects were looking for a place to spend the winter: hence the house for hibernating or sheltering. Dr. George McGavin makes the point in his book, ‘Insects’ , that common lacewing adults are nocturnal and attracted to lights, often entering houses to hibernate. Hopefully, this new home will be bustling with activity later in the year. Father Christmas managed to find a lacewing/ladybird home from the company, Wildlife World Ltd, of Tetbury, Gloucestershire, who state they make eco-friendly products for the garden. Our next step is to find the ideal site in our garden and hope that plenty of lacewings, or indeed, ladybirds (they seem to have been in very short supply over the last year), move in!